January | 2010 | the wine snob. He is a man of many talents, but most of all, he is a drinker of fine German riesling. 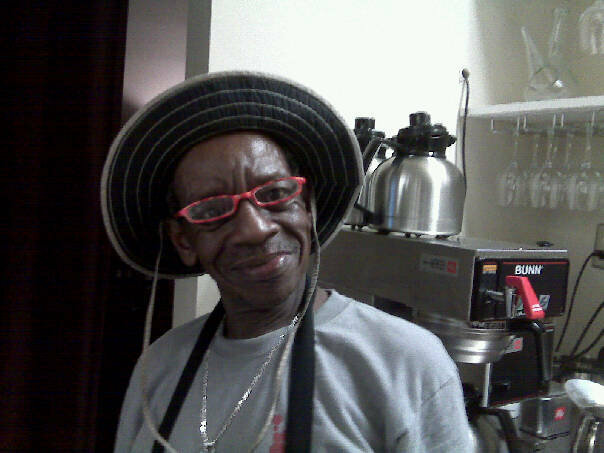 It is actually somewhat blasphemous to include a shout-out to him in a post about Syrah, but I don’t think he’ll mind! And if you ever lose your earring at Cellar, he will find it and hang it on his hat. But moving on to said Syrah- this killer little bottle is from the Lodi region of California, a place known for making some pretty darn delicious Zinfandel, among other varietals. Anyone remember the 7 Deady Zins that we poured by the glass at Cellar a while back and people couldn’t get enough of at the Wine Sales? This is made by the same folks. Lodi is about an hour south of Sacramento and has much hotter summers than the more northern wine regions in Cali. I think wines from Lodi are a perfect fit for Columbia, SC- because we know what it’s like to be overshadowed by a neighboring city (hint: starts with a Chuck and ends with a Town). I’ve never been to Lodi, but I think I would love it. The people there seem to have a lot of pride for their wine in a way only an area that has played second-fiddle to Napa-the-great could have. So as it turns out, Lodi makes awesome Syrah as well as Zin! And such a bargain! 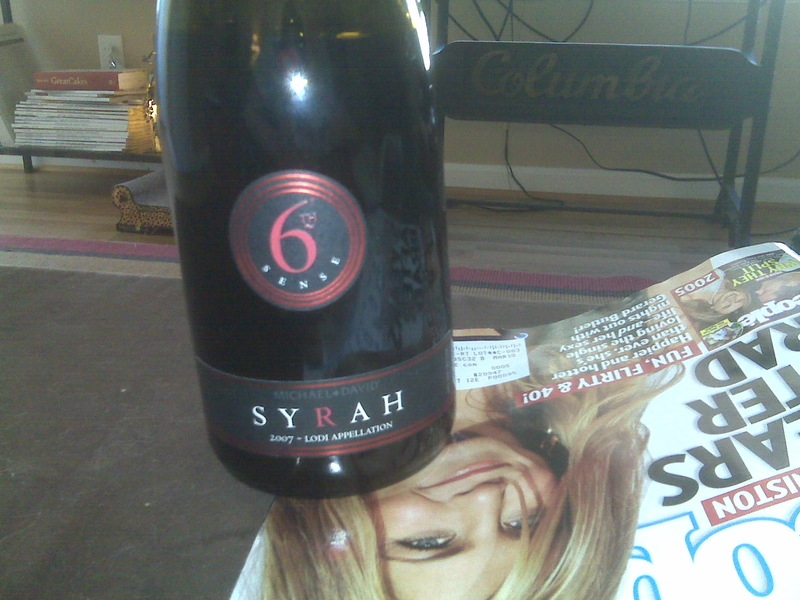 This 6th Sense Syrah will retail for $16 at Cellar, and it is packin’ some serious heat for that kind of cash. Dark, dark in color, it’s nose will knock you out with aromas of tobacco, smoke, cedar, blackcurrants, plums, plums, plums and ohh a lovely little hint of smoked bacon, too. A perfectly smooth, velvety texture and light pepper on the finish round it out pretty darn well. This is a great winter wine- it will warm you to the bones. Here is is on my ottoman/coffee table aside my latest People magazine. I almost included my feet in the picture, so you could get the full effect of what I do when I’m at home writing… I do like to create a visual, but hesitated when I realized that my toenail polish is in dire need of reparations. I can admit to it, but admitting it and photographing it are two different matters entirely. You’re welcome. We have about a case of this in stock right now (Wednesday the 27th) so I anticipate we will have some at the Wine Sale this Saturday for your tasting pleasure- but feel free to come down and pick up a bottle before then! I don’t think you need to try it- just trust yours truly, I don’t think I have ever led you astray. Happy Drinking! So, here I am in the office. It’s barely noon as I write this, and yet I am dipping into a magnificent glass of wine. I know, I know… I am at work, and it’s early. But tonight is my night off! and this wine is just too good. I couldn’t possibly write about it thoughtfully without drinking some. Surely impossible, and inauthentic. So I consider it an occupational hazard that I must endure for the time being. Poor me. It occurred to me this morning that I have not blogged about a Chardonnay yet. This is literally a perfect choice to break that spell. I will also let it be known that I LOVE a good Chardonnay. Emphasis on the good. Likewise, I also loathe (in my opinion) a nasty Chardonnay. In all of 2009, I can’t really say I found a California Chard in this price range that I loved- the last one I recall loving for $14 was a French Chard called Les Morizottes that we poured by the glass at Cellar and Solstice for quite a while. The reason Chardonnay is such a cool grape is that it can take on so many different characteristics. I read somewhere that it has been called the “chameleon” of grapes because of this. I find that for my taste, a nice light unoaked chardonnay is where it’s at. Chardonnay has a natural mineral content that is really beautiful when it is expressed well. Most people don’t associate this with Chardonnay, as California has made a habit of producing very rich, buttery, oaked Chardonnay. As Jerry Seinfeld would say, “not that there’s anything wrong with that.” I like a rich, elegant Chard too- but from my experience it is harder to find one that is “good” by my standards in the $15 or so price range. 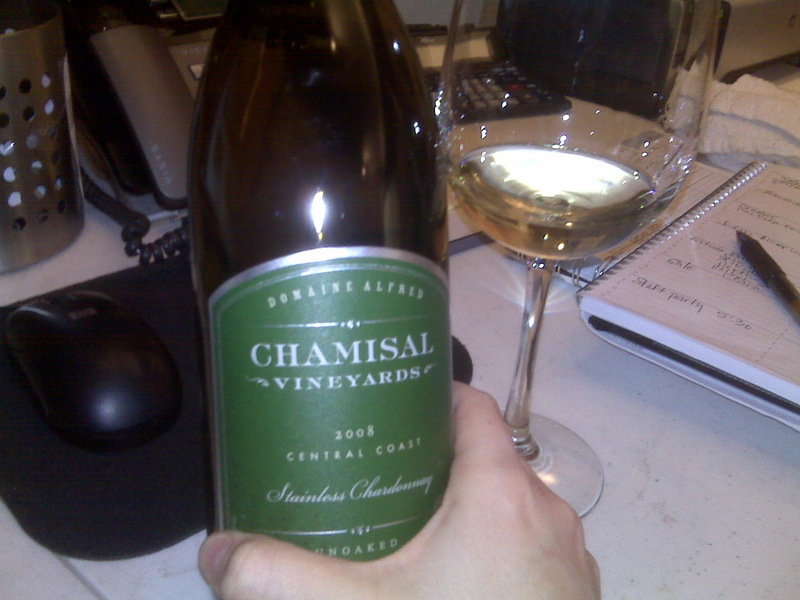 Which was a loooong winded way of saying (sorry, I get wordy when I drink wine at noon) that this Stainless Chard from Chamisal is DELICIOUS!!! Fresh, lively, clean and vibrant. Notes of pineapple, honeydew melon, green apples, citrus, and a nice light spice on the finish. This is a cheerful, sunny, pretty wine. Also, on the plus side, it is one of those wines that looks a lot more expensive than it is. The packaging is simple and tasteful and they call it “stainless” rather than unoaked, which for some reason makes it seem more high-tier. Sounds like a genius marketing team was at work here, which truthfully, is okay with me. I love to think about the reasons people buy things, and something as simple as a different wording is enough, psychologically speaking, to boost sales. Fascinating.